One of my favorite sayings with some of my favorite people is, “You are the salsa to my chips!” I am sure there are many who would beg to differ with a “You are the guac to my chips!” Really just depends on what you prefer (I definitely go back and forth). But the saying goes that one without the other is nothing great at all. Plain tortilla chips? Mediocre. Chips and salsa? Best thing ever. Bringing this into the corporate world for a minute, so bear with me. Amazon Web Services (AWS). Ever heard of them? They are only the largest provider of cloud infrastructure-as-a-Service and own 45% share of the worldwide market,according to a quarterly analysis by Synergy Research Group. Well, Riverbed brings a cloud-centric SD-WAN solution that goes hand-in-hand with AWS. What does this mean for you? It means that you can securely connect branch locations to the AWS Cloud with a single click. And this is why I am bringing it into the corporate world. 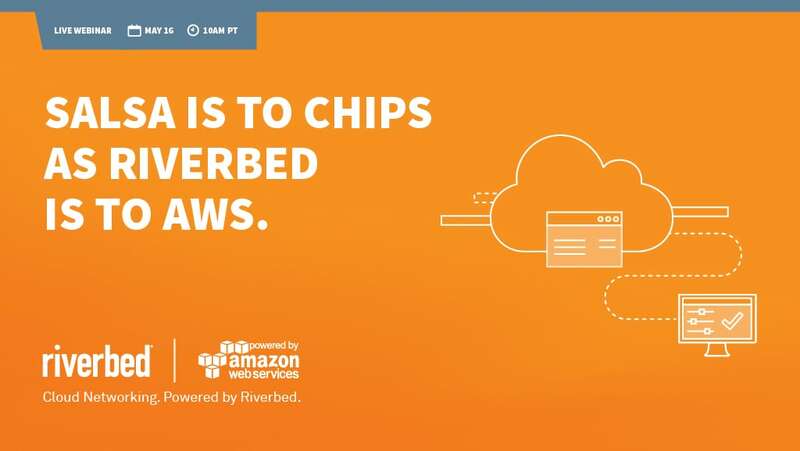 Riverbed is the salsa to AWS’ tortilla chips. Or the guac, whatever you prefer. We all know that leveraging the AWS Cloud can increase IT agility and reduce operational expenditures. But, your ability to get the most out of these benefits is often dependent on your networking capabilities. For instance, is there any real added agility if it takes you a few minutes to set up a handful Virtual Private Clouds (VPCs), and a month to set up full mesh connectivity between branch locations and those VPCs? And what about control? Which users should access what VPCs? What does the performance look like? This means you get the most of your networking capabilities, and some! I encourage all of you chips and salsa lovers (or guac), to come learn more from our very own, Angelo Comazzetto, Technical Director of Cloud, and AWS’ Nick Matthews, Partner Solutions Architect, at our live webinar with AWS on May 16 at 10am PT. During this webinar, you’ll learn through a super interactive demo (no boring slides, well maybe just a few) how Riverbed’s SD-WAN solution enables cloud migration and performance, all managed via quick and simple workflows. In addition, you will hear an actual customer, Craig Bruce from OpenEye Scientific, show you how he was able to save time and money, gain better performance, and install Riverbed SteelConnect in their VPCs in minutes. Register here, and see you all on May 16! Learn more about how Riverbed optimizes cloud networking for AWS.